Is it time to switch to a fixed-rate home loan? Anyone thinking about locking into a fixed rate loan will generally spend a little time considering the future movement of interest rates. Below we share some tools that can provide insight into what interest rates are expected to do over the short-medium term. We’re currently looking at what these tools may be indicating and share the results below, as at 20 Feb 2019. The Cash Rate Futures Yield Curve shows how the market expects interest rates (or more specifically the RBA cash rate) to move over the short-medium term. The curve does not 100% accurately predict how things will play out, but it’s helpful to show what the market expects to happen with regards to interest rates. It’s also interesting to watch how these market expectations change over time. For example, the Cash Rate Futures Yield Curve at July 2018 reflected market expectation of a cash rate increase towards the end of 2019. However, the Yield Curve as at 20 February 2019 as shown below, suggests the market now expects the cash rate to fall. 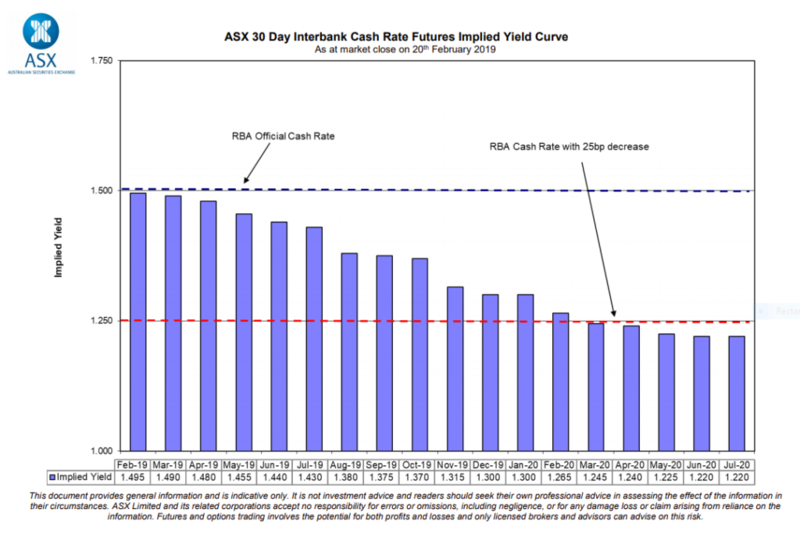 You can find the ASX 30 Day Interbank Cash Rate Futures Implied Yield Curve here. If we review Minutes from the February 2019 RBA Board meeting, GDP growth in the September quarter was weaker than expected. Growth in household income was also low. Plus, housing markets in Sydney and Melbourne and still going through a period of adjustment. Add to this tighter lending standards “credit conditions for some borrowers are tighter than they have been” and Royal Commission outcomes, it shouldn’t be a surprise that market expectations around interest rate movements have changed. APRA imposed lending regulations have been deemed effective in slowing the volume of interest only/ investment lending. So much so, that APRA lifted these restrictions in Jan 2019, potentially helping to slightly ease the flow of lending, without requiring cash rate intervention from the RBA. We can see from the chart that historically, movement of the 3Yr Fixed rate has preceded a corresponding movement of the SVR. 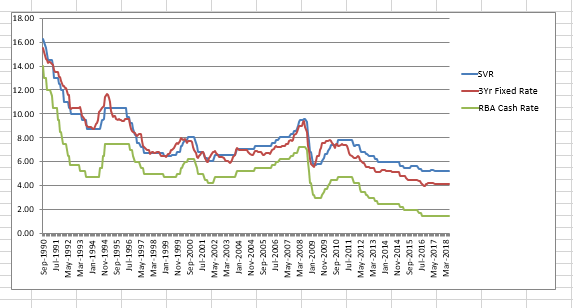 For example, when the 3yr Fixed Rate has risen above the SVR, we can see that the SVR has followed – albeit with lag time. At these particular points on the chart, you may have done well with a fixed rate loan. Conversely, on occasions where the 3yr Fixed Rate changed direction and moved below the SVR, the SVR has followed – again with a lag time. In these instances, you may have been better off with a variable rate loan. The chart shows no overlap of the 3Yr Fixed Rate and SVR plot lines in recent times though, making it hard to use these historical patterns to predict future rate movements right now. It’s also important to note that using historical data (and applying patterns borne from historical data sets) comes with its own limitations. However, it’s a tool we’ll continue to look at as rates continue to change. What does this mean for you and your loan? The analysis above suggests that an increase to the cash rate is unlikely over the short term. However, this DOES NOT mean your current home loan rate will remain the same. We all know that lenders are free to change their home loan rates independent of any change to the RBA cash rate. 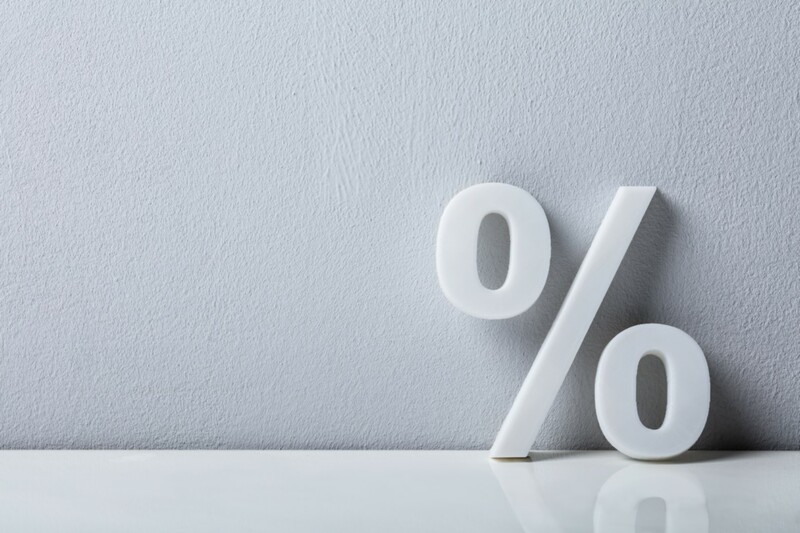 And outside of the standard rates offered, some lenders offer discretionary pricing which helps you to reduce the rate you *personally* pay on your home loan. Learn more about discretionary pricing and what it is here. Should you fix your loan or stay variable? In an ideal world, we’d all love to lock into a fixed rate loan at exactly the right time and save ourselves a whole lot of interest. But not even the experts know exactly what interest rates are going to do. Which makes switching at exactly the right time – for exactly the right fixed term – quite challenging. We always suggest taking a look at the bigger picture when considering your fixed vs variable rate decision. You need to think of it as part of a broader borrowing strategy. Will a fixed rate loan help to diversify your loan portfolio (and protect against variable rate rises)? Will a fixed rate loan help/ hinder your plans to grow/ consolidate your property portfolio? Will a fixed rate loan help you better manage your outgoings? Whilst there are specific situations when a fixed rate loan is beneficial (you can find them here) and others when a variable rate loan is more suitable (we outline them here), you can always combine the best of both worlds by splitting your loan into part variable and part fixed. Sounds like there are too many things to consider? Get in touch with out team – we can help you work through your options. This post was published 21 February, 2019. This information here is provided for general purposes only and does not constitute financial advice. Before any specific lending or loan structure is recommended to you personally, a thorough Preliminary Assessment would need to be conducted to ensure any credit advice provided by MO’R Mortgage Options Pty Ltd is not unsuitable for your specific financial situation.